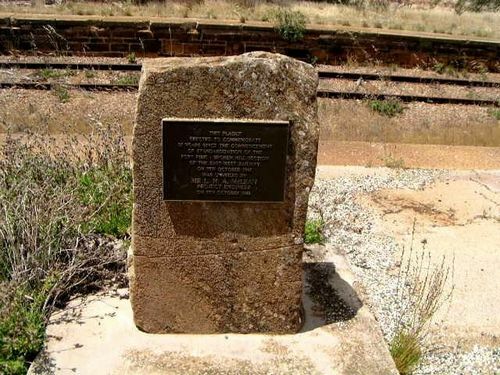 The Standard Gauge Monument commemorates the 25th anniversary of the standarization of the Port Pirie to Broken Hill Railway. Terowie's initially served as a transport hub for the late 19th-century pastoral settlement of the north-east of the State. The broad gauge line from the south (via Burra) ended at Terowie. Soon a narrow gauge line continued 20 km north to Peterborough, where lines from Perth, Western Australia, Alice Springs, Broken Hill and later Sydney met. Thus Terowie functioned for decades as the transshipment point at the railway break-of-gauge. The broad gauge line was extended from Terowie to Peterborough in the 1970s, and Terowie went from a thriving township into something of a perfectly preserved ghost-town. The railway line was closed and removed in the early 1990s.